On this beautiful “Inspired Wednesday” I’m sharing something very personal and dear to me…our dream wedding!!! You’ve seen my outfits, my travels, some of my friends and family on Dress Chic For Me as well as various aspects of my wedding journey/adventure. From planning to my wedding dress search to my Bridal Shower you’ve been here every step of the way and I want to thank you for that :)! So it’s only right to share our wonderful highlight wedding video with you as well so you can see us in action ;)! It’s really cool to plan something for over a year and then see it all come to life on one incredible day! Planning our wedding was a LOT of work, I’m not going to sugar coat it. This is a honest, truthful blog where I share my real feelings with you all! But all of that hard work and the blisters (luckily no blood), sweat & tears was totally worth it to have our dream wedding and my wedding vision come to life! I would do all the planning over again in a heartbeat if that meant we could relive our wedding day again…luckily we basically can with our wedding video, no more planning required ;)! Campbellicious was our wedding videographers and they were so great!! Check them out if you’re a bride-to-be! I love KC’s ability to capture natural and organic moments throughout the entire day. He truly is an artist with a great eye who totally knows what he’s doing! 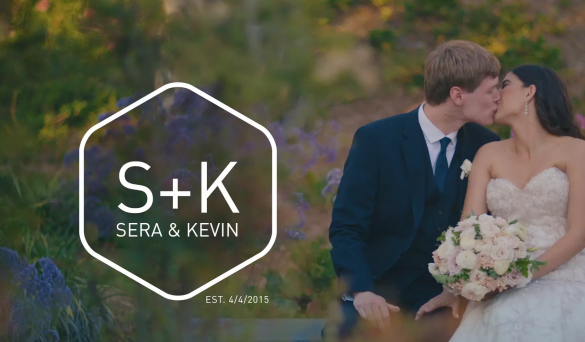 Trust him to capture your wedding on film and you will not be disappointed! Literally every time I watch this video I feel transported right back to that amazing, dreamy, best day ever day where I got to marry the love of my life!!!!! When we got engaged Kevin and I would half jokingly (half not) talk about eloping/having a very small wedding/a destination wedding/going to City Hall…basically every possible option to keep it simple and easy (and cost effective). Yet, for us personally none of those options would have been as good as our large and awesome celebration of love that we were so fortunate to have as our perfect wedding in La Jolla!!! It was a big, fun, emotional, joyous party filled with: tons of dancing, delicious food & drinks, great music, sweet speeches & most importantly all of those who love us and that we love so!!! All of our friends and families together in one place from all over the world & US there to celebrate with us was truly amazing for us to witness and be a part of!!! We are extremely lucky to have had the full support, love and help from both of our fab families because without them this wedding could not have happened. Thank you to both our moms, dads and siblings :)!! We love you all so much!!! So without further ado here is our wedding highlight video. Enjoy :)! This entry was posted in Bridal, dress chic for me, dresschicforme, Embroidery, fashion blogger, feeling fine, Floral, good food, good wine, Gown, Head Accessory, Hearts, High Heels, Inspiration, Metallic, Neutral, Neutrals, Sparkly, Travel, vacation and tagged campbellicious, Campbellicious Video, dream wedding, Dress chic for me, dresschicforme, fashion blogger, fashion diary, Hilton La Jolla Torrey Pines, hilton torrey pines, inspiration, La Jolla, La Jolla wedding, our dream wedding, real wedding talk, real wedding thoughts, San Diego, San Diego Bride, San Diego Videographer, san diego wedding, Torrey Pines, videographer, wedding, wedding highlight video, wedding inspiration, wedding video. Bookmark the permalink.